There are many things to do in Gettysburg PA aside from visiting the famous battlefield. Gettysburg is a growing town with new businesses and attractions being added each year. If you haven't been to Gettysburg before, or you thought you had done it all on your last visit, read on to find out what is fun to do in this town. Most of the fun things to do in Gettysburg PA are on the town's trolley route or within walking distance from your place of lodging. If you love a parade, this is the town to see them in. Many of the tourists stop by during the most patriotic times of the year - Memorial Day, the Fourth of July, Labor Day and Remembrance Day. Planning to be in town during these peak times requires a little advance planning since rooms in local establishments are at a premium. Make reservations several months in advance to ensure you have a place to stay on these weekends! 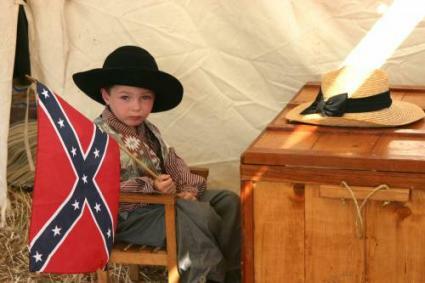 Living History Encampments- April through October. Contact the National Military Park at 717-334-1124 or visit the NAP website for the exact dates during the year. American Civil War Museum Encampments- To find out the dates for the encampments throughout the year contact the museum at 717-334-6245 or visit the museum's website. Apple Blossom Festival- This festival is traditionally held the first week of May. Contact the Adams County Fruit Growers at 717-677-7444 for more information. National Apple Harvest Festival- Usually held during the first and second weekends in October. Contact the Upper Adams Jaycees at 717-677-9413 or visit the festival's website for more information. You'll never be bored in the Gettysburg area if you enjoy the arts! The following places have live theater and music frequently throughout the entire year. The Majestic- Live theater, ballet, Irish dancing and comedy shows. Recent performances include Giselle and Ain't Misbehavin' Contact the box office at 717-337-8200 for membership or ticket information. The Eichelberger Performing Arts Center- Many series events to choose from during the year. Call 717-637-7086 for details. Allenberry Resort Inn & Playhouse- Dinner theaters, mystery weekends and more for the whole family. Call 1-800-430-5468 for performances and reservations. Like the great outdoors? There's plenty for you to do too! The Links at Gettysburg- Call 717-359-8000 Ext. 25 for tee times. Gettysburg Bike Tours- Ride your bike at your leisure in this historic area. Call 717-752-7752 for details. Granite Hill Adventure Golf- Take the kids out for a little fun with putt-putt golf in the cool evening while at Gettysburg. Mulligan MacDuffer Adventure Golf- Another great putt-putt golf place for kids. The National Riding Stables- Reservations recommended. Ride the park's horses or bring your own. Call 717-334-1288 or 866-932-2674 for details. Love wine tasting and visiting vineyards? Check out the Adams County Winery for special events throughout the year. For more information on the following events, contact the winery at 717-334-4631, or visit their official website. Free summer concerts, with wine, of course! Bring your blanket and picnic basket. No town likes to throw parties like the town of Gettysburg in the winter. The following events draw crowds during the coldest months of the year. Annual House Tour- A yuletide celebration! Contact the Gettysburg Bed and Breakfast Inns for more information. Christmas Parade- Takes place in downtown Gettysburg, usually the last weekend in November. Call 717-334-6274 for more information. Annual Victorian New Year's Ball- Special guests include President Lincoln and Generals Lee and Grant and their wives. Period food, music and dancing. Period dress for attendees is encouraged. Annual Tree Lighting Ceremony- Start your holiday season off right at Boyds Bear Country. Call 866-367-8338 for more information. World War II USO Christmas Dance and Eisenhower Weekend- Hosted by The Gaslight Inn. Visit their website or call 717-337-9100 for details. There are literally dozens of more things to do while in Gettysburg! Want to learn more? Visit the Gettysburg Convention & Visitor's Bureau to request a copy of their official visitor's guide.